For other people named Bill Watkins, see Bill Watkins (disambiguation). William Henry Watkins (May 5, 1858 – June 9, 1937), sometimes known as "Wattie," or "Watty," was a Canadian-born baseball player, manager, executive and team owner whose career in organized baseball spanned 47 years from 1876 to 1922. He began playing organized baseball in Canada and Michigan and played one season of Major League Baseball as an infielder for the Indianapolis Hoosiers in 1884. He was a manager of five major league clubs and several minor league clubs, including stints with the Indianapolis Hoosiers (1884–85), Detroit Wolverines (1885–1888), Kansas City Cowboys (1888–89), St. Louis Browns (1893) and Pittsburgh Pirates (1898–99). He led the 1887 Detroit Wolverines to the first professional sports championship for Detroit with a National League pennant and a victory over the St. Louis Browns in the 1887 World Series. He was also the business manager of the 1914 Indianapolis Hoosiers team that won the Federal League pennant, the first and only major league baseball championship for Indianapolis. Watkins was born in Brantford, Ontario, Canada, in 1858. His parents, John Harton Watkins and Eliza Jane (Tyler) Watkins, were immigrants to Canada from Wales and Ireland, respectively. His mother died in 1868, and he was thereafter raised by his maternal grandparents in Erin, Ontario. Watkins attended Upper Canada College in Toronto for one year, and he began playing organized baseball in 1876 as part of "the academy team" in Milton, Ontario, a suburb of Toronto. He also held jobs as an apprentice for a manufacturer of novelty games and with a branch of the Ingles Corliss Engine Works. In 1879, at age 21, Watkins moved to Port Huron, Michigan, where he lived for the next 40 years. From 1879 to 1880, Watkins played for the Maple Leafs of Guelph in Southwestern Ontario. The Maple Leafs won the Canadian amateur championship while Watkins was a player. In 1881 and/or 1882, he was a player-manager for the Atlantic Club of St. Thomas, Ontario (part of the London, Ontario metropolitan area). He led the Athletics to the Ontario provincial baseball championship in 1881. Watkins joined the Port Huron, Michigan, baseball club late in the 1882 season. In 1883, he served as player-manager for the Port Huron club, playing at third base, and leading the club to a Michigan State League championship. 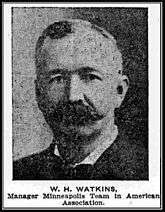 In September 1883, Watkins was hired to take over as manager of the Bay City, Michigan club for the 1884 season at a salary of $2,000. He led Bay City to a tie for first place in the Northwest League when the team disbanded in July 1884. On August 1, 1884, Watkins made his major league debut with the Indianapolis Hoosiers of the American Association. Watkins appeared in 34 games, 23 at third base, nine at second base and two at shortstop. Watkins also took over as the Hoosiers' manager, compiling a 4-18 record. With two out, Watkins came to bat and fell a victim to one of the swift curves of Shallix. The poor fellow ducked his head, but it was too late, and the ball caught him on the temple. He rolled over into the diamond, while a thrill of horror passed through the hearts of those in the stands. He was half carried, writhing nervously with pain, to the directors' room, where it was found that though the shock to his system had been great, no bones were broken. Newspaper accounts indicate that he "hovered between life and death" for five days. It took two weeks for him to recover and during that time, he lost 16 pounds. Watkins returned briefly as a player after the injury, but his performance was substantially diminished. On September 14, 1884, Watkins' error at second base let in most of Baltimore's runs in a 4-4 tie game. He appeared in his final game as a player on October 13, 1884. Newspaper stories published in 1912 in the Indianapolis Star and in 1937 in The Sporting News claimed that Watkins' hair turned prematurely white in 1884 due to the injury sustained when he was struck on the head. In his biography for the SABR Baseball Biography Project, Bill Lamb wrote that the story about Watkins' hair turning white appears to be "folklore", as "post-beaning photographs" (including the image displayed above) "show Watkins with reddish-brown hair and mustache until he was well into middle age." In 1885, the Indianapolis club in the American Association disbanded. Along with Ted Sullivan, Tom Loftus, and George Tebeau, Watkins helped organize the original Western League, a minor league baseball circuit based in the Midwestern United States. A new version of the Indianapolis Hoosiers was established in the Western League with Watkins as the manager. In April 1885, The Sporting Life praised Watkins' effort in maintaining "rigid discipline", putting an end to the "carousals" of the prior year, and ridding the club of "the whiskey element", and noted that Watkins had become "the most popular and efficient manager the club has ever had." By mid-June, the Hoosiers were the dominant team in the Western League, compiling an .880 winning percentage. However, the league disbanded in mid-June, and a rush developed to sign the players on the Indianapolis roster, a line-up that included Sam Thompson, Deacon McGuire, Sam Crane, Jim Donnelly, Chub Collins, Mox McQuery, Gene Moriarty, and Dan Casey. We were prisoners, but well cared-for prisoners. Anything in the line of creature comforts you could find packed away on ice. We lived on the best in the market, and spent the rest of the time in fishing and playing poker, chips having very thoughtfully been provided. On the night of the tenth day, at midnight, we were all taken ashore where Watkins met us and signed us to our contracts. The players were only later presented with their accumulated mail which included scores of offers from other clubs. A writer in the Detroit Free Press noted: "Detroit magnates showed some inside baseball brains and great finessing in sending the players away from all tempters for that period when they belonged to no club." When Watkins took over as manager of the Detroit Wolverines in June 1885, the team had compiled a 7-31 record to that point in the season. With the infusion of talent from Indianapolis, the team improved to 34–36 for the remainder of the 1885 season. Late in the 1885 season, Detroit acquired four players from the Buffalo baseball club (Jack Rowe, Dan Brouthers, Hardy Richardson, and Deacon White) who were known as the "Big Four." The "Big Four" were "regarded for many years as the greatest quartette in the history of the national pastime." The "Big Four" joined Detroit for the 1886 season. With the addition of the "Big Four", the Wolverines improved substantially, finishing in second place with a 85-38 record in 1886. The 1887 season was the pinnacle in the history of the Detroit Wolverines. The team was loaded with hitters, including six regulars who hit above .300: Sam Thompson (.372 and 166 RBIs in 127 games), Dan Brouthers (.338 and 101 RBIs in 123 games), Larry Twitchell (.333), Hardy Richardson (.328), Jack Rowe (.318) and Deacon White (.303). The pitching staff was led by "Pretzels" Getzein, a curveball specialist who compiled a 29–13 (.690) win-loss records and a 3.73 earned run average. Outfielder Larry Twitchell also started 12 games as pitcher and compiled an 11–1 record. The Wolverines won the National League pennant with a 79-45 record and then defeated the St. Louis Browns in the 1887 World Series. During the 1888 season, the Wolverines fell to fifth place. In late August 1888, the Detroit club fired, or accepted the resignation of, Watkins as their manager, and Robert Leadley was hired as "acting manager" in his place. The Wolverines compiled a 49–44 record in their final year under Watkins. 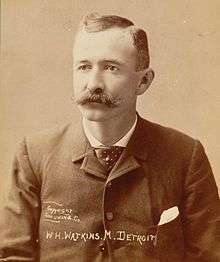 After parting ways with the Wolverines in late August 1888, Watkins was hired in early September 1888 as the manager of the Kansas City Cowboys of the American Association. He led the club to an 8–17 record in the final month of the 1888 season and a 55-82 record in 1889. In June 1890, Watkins was hired as the mid-season replacement manager for the St. Paul Apostles of the Western Association. Watkins had little success in turning the St. Paul club around, and in August 1890, The Sporting Life reported that Watkins had been forced to release players and cut salaries to reduce expenses, and that he was "running the St. Paul team economically according to instructions", though he hoped to have a stronger team in 1891. The Apostles finished in last place in 1890 with a 37-84 record. In September 1890, with the St. Paul club losing money, C. L. Flatley, a personal friend of Watkins, purchased the club and promptly signed Watkins to serve as the club's manager again in 1891. However, Flatley had sold the club by December 1890. In June 1891, with the Apostles continuing to struggle financially and on the field, the club was sold and moved to Duluth, Minnesota. Two months later, in August 1891, the club disbanded, and Watkins was left with financial responsibility for half of the Duluth team's unpaid player salaries. He has been as watchful of his men in the dark hours of the night as any man with self-respect could be, he has been always safe in his financial policy, his judgment of players has never gone wrong, he has been a stickler for finished team work ... He has been a dignified gentleman throughout and, considering the circumstances, the highest success as a manager... Local cranks will wish him unlimited success in every undertaking, and bear on with the hope that he may again pilot base ball in Rochester in 1893. In 1893, Watkins was hired as the manager of the St. Louis Browns (later renamed the Cardinals) of the National League. Under owner Chris von der Ahe, the Browns had gone through five managers during the 1892 season, finishing in 11th place with a 56–94 (.373) record. Watkins remained the manager for the entire 1893 season and led the club to a 57-75 (.432) record and a 10th-place finish in 1893. By 1894, Watkins had won pennants as a manager in St. Thomas, Port Huron, Detroit and Sioux City, and had led teams in Indianapolis and Bay City to first place in seasons that ended prematurely; the Sporting Life at the time asserted that Watkins had "the distinction of piloting more pennant winners than any other manager before the public to-day." From 1895 through the early part of the 1898 season, Watkins was the manager of the Indianapolis Hoosiers/Indians in the Western League. Watty is a firm base ball man, knows the practical side of the sport, and in the writer's recollection one of the few chiefs in the Pittsburg Club's employ who had courage to rebuke with spirit and determination players violating edicts, etc. Discipline prevails in his club. His iron-bound policy of directing plays of course cannot be popular with players, but if dictation is absent and appeal impossible the method may be pushed to success. The chief objection to the Watkins system is that it compels players to lose all individuality and become a mere portion of the machine that Watkins makes of his team. According to Walter Brodie, late of Pittsburg, and now of the Orioles, Watkins is the most autocratic of autocrats. He establishes rules that must be lived up to the letter, and no man on the team must have a mind of his own. ... Watkins success, then, lies in making machines of his men and thinking for them. Watkins described his sign system as follows: "I have only four, one telling the player to sacrifice, the second for the hit and run game, the third to hit the ball out, and the fourth to bunt. This completes the list, and they are as simple as can be. But when I give a player instructions what to do he will obey or get out of the club." Watkins returned as the Pirates' manager in 1899 at an annual salary of $4,500, but he resigned in May 1899 after the team began the season with a 7-15 record. Watkins said at the time that he had other business to attend to, that he intended to quit baseball for good, and that he planned to return to his farm in Wadhams, Michigan: "I am going back to the farm to see the horses and dogs. I have wanted to give up base ball for some time past. A turbulent life? I should say so. I will go into a quieter business." In November 1899, Watkins purchased the Indianapolis Hoosiers of the American League from John T. Brush for "something like $10,000." Watkins also leased land on the east side of Indianapolis and announced plans to build a new baseball field there. Speculation was immediate that Watkins was not a bona fide purchaser of the club and that he had "purchased" the club as a front man for Brush, who had been roundly criticized for his manipulations of the lineups of the two clubs (the Cincinnati Reds and Indianapolis Hoosiers) that he owned. Watkins also served as manager of the 1900 Indianapolis team, compiling a 71-64 record and finishing in third place. After American League president Ban Johnson converted the circuit into a major league, eliminating Indianapolis' spot in the league, Watkins was a leader of efforts in early 1901 to re-establish the American Association in competition with the American League. In January 1901, he was named chairman of the new league. The efforts to establish a new American Association were unsuccessful, and Watkins' Indianapolis club joined the Western Association for the 1901 season. He sold the club in July 1901, and it was moved to Matthews, Indiana. It is useless to mention him as Mr. W. H. Watkins. There are others of that name, while there is only one Watty. The exuberance of his eye, the thrill of enthusiasm in his voice and the general air of conquest surrounds him, told eloquently that Watty was happy. He leaned back in his mahogany chair in the pennant office in the Majestic building and illuminated every part of the room with his sunny countenance. He was in a benign mood, loquacious and enthusiastic. Watkins' 1903 team drew only 88,000 spectators, the lowest attendance in the American Association. In October 1905, Watkins authored a lengthy article for The Minneapolis Journal outlining his views on the value of baseball as a game wherein "brains must be combined with skill", a game that "demands temperance and proper living", and "as an element of great good in American life." In December 1905, Watkins sold his ownership interest in the Minneapolis baseball club to Mike Kelley. The sale price was not disclosed but was "said to be in the neighborhood of $50,000." Watkins returned to Indianapolis in 1906 as manager of the Indianapolis Indians of the American Association. The Indianapolis Morning Star reported that local baseball fans were "rejoicing", and that Watkins was "regarded as the most competent manager in the American Association." He had retained his half ownership interest in the Indianapolis club even while he was managing the Minneapolis team. He was also president of the club from 1906 to 1912. He stepped down as bench manager in May 1906, turning over responsibility of bench manager to Charlie Carr. As of January 1912, Watkins owned interests in baseball clubs in three different leagues: the Indianapolis Indians in the American Association, the Springfield, Ohio club in the Central League, and the Newark, Ohio club in the Ohio State League. The Springfield and Newark clubs were both farm teams for the Indianapolis club. In February 1912, the Sporting Life reported that Watkins actually had a say in four minor league clubs and referred to him as the "monarch of the minors." For more than thirty years he has been a prominent figure in baseball. He was one of the organizers of the American Association ... Mr. Watkins is a baseball man of the old school and he has been in the thick of all the grueling battles through which organized baseball has passed to bring it up to its present standard as one of the greatest amusement enterprises in the country. He has been through five baseball wars, and, as he says, 'went broke' in every one of them. While Watkins was generally regarded as a good judge of talent, he and manager Charlie Carr were criticized in hindsight for having sold Grover Cleveland Alexander (later inducted into the Baseball Hall of Fame), Marty O'Toole and Buck O'Brien for a mere $750 while they were president and manager of the Indianapolis club. In February 1914, Watkins was hired, at a salary reported to be $8,000, as the business manager for the Indianapolis Hoosiers team in the newly formed Federal League. Upon his hiring, The Sporting Life opined: "William H. Watkins has served the game as player, manager, and magnate for three decades, with credit to himself and the sport, and his re-entrance in the Indianapolis field, where he labored for the greater part of his brilliant career, is absolutely certain to redound to the advantage of his new club and league." Watkins told the press: "I know that Indianapolis, with its large suburban population, is large enough and has enough enthusiastic fans to support two base ball teams so long as there is no serious confliction in dates. I am glad to get back into the harness and particularly glad to return to Indianapolis." The 1914 Hoosiers compiled an 88-65 record and won the first Federal League pennant, the first and only major league pennant in Indianapolis baseball history. However, in late March 1915, a deal was struck that resulted in the Indianapolis club being moved to Newark, New Jersey. Watkins did not follow the team to Newark. In all, Watkins was affiliated with Indianapolis baseball clubs in seven different leagues: the 1884 Hoosiers in the American Association, the 1885 Hoosiers in the first version of the Western League, the 1895-98 Hoosiers/Indians in the second version of the Western League, the 1900 Hoosiers in the American League, the 1901 Hoosiers in the Central League, the 1903 and 1906–1910 Indians in the 20th century version of the American Association and the 1914 Hoosiers in the Federal League. From 1920 to 1922, Watkins served as president of the Port Huron baseball club. In 1921, Watkins was one of the principal backers of the Port Huron club when it joined the Michigan–Ontario League. Watkins resigned the club's presidency in May 1922 in a letter stating that his business commitments prevented him from devoting the time needed for proper management of the club. Watkins was married in 1884 to Edna Buzzard. They apparently had no children. Watkins became a naturalized United States citizen in 1897. After retiring from baseball, Watkins lived in Port Huron, Michigan, and worked as an executive at banks and land development and manufacturing companies. 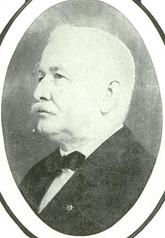 He also served as president of the Port Huron Chamber of Commerce and helped found the city of Marysville, Michigan, serving as the first village president and chairing the committee that incorporated Marysville into a city. He was elected justice of the peace in Marysville in 1933. Watkins died from diabetes in 1937 at age 79 in Port Huron, Michigan. He was survived by his wife, Edna, and was buried at Lakeside Cemetery in Port Huron. The field used by both the Port Huron semipro and high school baseball teams was named Watkins Field in his honor (though it ceased being used in the early 1940s). Watkins was inducted into the Port Huron Sports Hall of Fame in 2008. 1 2 3 4 5 6 "William H. (Wattie) Watkins obituary". The Sporting News. June 17, 1937. p. 2. 1 2 3 4 Edgar Brands (July 8, 1937). "Beanball Turned Watkins' Hair White". The Sporting News. p. 4. 1 2 3 4 "Bill Watkins Statistics and History". baseball-reference.com. Retrieved July 28, 2014. 1 2 3 4 5 6 7 8 9 10 11 12 13 14 15 Bill Lamb. "Bill Watkins". SABR Baseball Biography Project. Retrieved July 28, 2014. 1 2 3 4 5 MAT (January 13, 1886). "From Detroit: Manager of the Big Team" (PDF). The Sporting Life. p. 1. ↑ Watkins' obituary in the Port Huron Times Herald, June 10, 1937. ↑ "Notes and Comments" (PDF). The Sporting Life. October 1, 1883. p. 6. ↑ "1884 Indianapolis Hoosiers". baseball-reference.com. Retrieved July 28, 2014. ↑ "Out of a Hole: How Cincinnati Bested Indianapolis". Cincinnati Enquirer. August 27, 1884. p. 2. 1 2 3 4 5 6 7 "Bill Watkins Minor League Statistics". baseball-reference.com. Retrieved July 28, 2014. 1 2 3 4 5 6 "Pioneer Baseball Man Out". Indianapolis Star. May 24, 1912. p. 7. ↑ "The Hoosier Team: The Effect of Manager Watkins' Discipline" (PDF). The Sporting Life. April 22, 1885. p. 3. 1 2 3 4 5 Maclean Kennedy (February 16, 1913). "Sam Thompson Ranks as one of the Great Sluggers of Baseball History". Detroit Free Press. p. 22. ↑ Fleitz, More Ghosts, p. 155. ↑ "1885 Detroit Wolverines". baseball-reference.com. Retrieved July 28, 2014. ↑ E. E. Pierson (1917). ""Old Hoss" Radbourne" (PDF). Baseball Magazine. p. 423. ↑ "1886 Detroit Wolverines". baseball-reference.com. Retrieved July 10, 2014. ↑ "1887 Detroit Wolverines". baseball-reference.com. Retrieved July 10, 2014. ↑ "Watkins Steps Down: His Resignation Accepted by the Directors of the Club And Robert H. Leadley Appointed Acting Manager". Detroit Free Press. August 28, 1888. p. 8. ↑ "1888 Detroit Wolverines". baseball-reference.com. Retrieved May 12, 2014. 1 2 3 4 "Bill Watkins Managerial Statistics". baseball-reference.com. Retrieved July 28, 2014. ↑ "A Reorganization: The St. Paul Club Once More in Shape and Under New Management" (PDF). The Sporting Life. July 5, 1890. p. 1. ↑ "St. Paul Changes: Players Released to Reduce Expenses" (PDF). The Sporting Life. August 23, 1890. p. 1. ↑ "Watkins and St. Paul" (PDF). The Sporting Life. August 16, 1890. p. 10. ↑ "Another Change: The St. Paul Club Again Changes Hands" (PDF). The Sporting Life. September 13, 1890. p. 7. 1 2 "St. Paul Pickings: Manager Watkins' Quiet, But Effective, Work" (PDF). The Sporting Life. January 10, 1891. p. 5. ↑ "A Western Break: The St. Paul Franchise To Be Transferred" (PDF). The Sporting Life. June 13, 1891. p. 1. ↑ "Duluth Done: The Club Drops Out of the Ring; The Players Sue For Unpaid Salaries; Their Destination and Prospects, Etc." (PDF). The Sporting Life. August 29, 1891. p. 12. ↑ "Rochester Ripples: A Brilliant Season Anticipated For the Rejuvenated Flour City" (PDF). April 23, 1892. p. 4. ↑ "Rochester Ripples: Manager Walking Hies Him to His Western Home" (PDF). The Sporting Life. October 1892. p. 3. ↑ "1894 Sioux City Cornhusers". Baseball-Reference.com. Retrieved July 30, 2014. 1 2 "Western Champions: The Men Who Captured the Western League Pennant" (PDF). Sporting Life. October 20, 1894. p. 6. ↑ "1898 Pittsburgh Pirates". Baseball-Reference.com. Retrieved July 30, 2014. 1 2 "Pittsburg Points" (PDF). The Sporting Life. May 27, 1899. p. 4. 1 2 "Pirates Prodded: The Expected Shake-Up in the Team Arrives; Manager Watkins, After Turning Things Over a Bit, Concludes That He Has Enough and Resigns, Donovan Succeeding Him as Manager" (PDF). The Sporting Life. May 20, 1899. p. 5. ↑ "1899 Pittsburgh Pirates". Baseball-Reference.com. Retrieved July 30, 2014. 1 2 3 "Magnate Watkins? The Ex-Manager Said To Have Become a Club Owner; The Indianapolis Club Sold to Mr. Watkins Outright by Mr. John T. Brush and the Other Stockholders For a Sum Exceeding $10,000" (PDF). The Sporting Life. December 2, 1899. p. 5. 1 2 "Minneapolis Glad at Watty's Coming: Baseball Man's Reputed Purchase for $10,000 Considered a Good Move". The Indianapolis Morning Star. November 6, 1903. p. 7. ↑ "1902 Indianapolis Indians". Baseball-Reference.com. Retrieved July 30, 2014. 1 2 "Kelley Purchases Minneapolis Club: Watkins Disposes of Millers to Ex-Manager of Saints -- Consideration $50,000". The Indianapolis Morning Star. December 27, 1905. p. 8. ↑ "Watkins to Return: Question Is Decided; Baseball Magnate Has Disposed of Minneapolis Club and Will Be With Indianapolis; Will Manage the Hoosiers". The Indianapolis Morning Star. December 31, 1905. p. A13. ↑ "Watkins Wants To Sell". The Indianapolis Morning Star. October 24, 1906. p. 7. ↑ "Watkins Will Open His Office Feb. 19: President of Indianapolis Club Will Soon Be Ready for First Work of Season; Promises Big Surprises; Second and Third Base Candidates to Be Chosen". The Indianapolis Morning Star. February 12, 1907. p. 7. ↑ "W. H. Watkins Arrives Ready to Build Up Club: Local Baseball Magnate Confident of Giving Indianapolis a Winner Next Season". January 7, 1908. p. 10. ↑ Copeland, H G (January 22, 1912). "Watkins on Hunt for Star Players: Will Depart for the Feast on Final Gumshoe Mission of Winter Campaign". Indianapolis Star. p. 8. ↑ Copeland, H G (January 12, 1912). "Watkins Takes Up Third League: Retains Franchise in Ohio State and Will Place Ball Team in Newark". Indianapolis Star. p. 10. ↑ A.R. Cratty (February 10, 1912). "Pirate Points" (PDF). Sporting Life. p. 14. ↑ "The Passing of W. H. Watkins" (PDF). Sporting Life. June 8, 1912. p. 17. 1 2 "Watkins in Line: The Famous Veteran Becomes Indianapolis Club's Business Manager" (PDF). The Sporting Life. February 28, 1914. p. 8. ↑ L. L. Goodman (March 7, 1914). "Hoosiers Happy Over Rapid Development of Federal League Club" (PDF). The Sporting Life. p. 91. ↑ "Gathering Them In" (PDF). The Sporting Life. February 28, 1914. p. 4. ↑ "1914 Indianapolis Hoosiers". Baseball-Reference.com. Retrieved July 30, 2014. ↑ "They Brought the 1914 Federal Pennant to Indianapolis". Indianapolis Star. October 11, 1914. p. A4. ↑ "The Champion Club of the Federal League" (PDF). Baseball Magazine. 1914. p. 22. ↑ "Newark Pepper Team History & Encyclopedia". Baseball-Reference.com. Retrieved July 30, 2014. ↑ "Federal League News: Circuit Problem Solved to General Satisfaction; The Kansas City Club Remains in Circuit, and the Champion Indianapolis Club Is Purchased and Transferred to Newark" (PDF). The Sporting Life. April 3, 1915. p. 8. ↑ Baseball-Reference.com states that, in 1911, Watkins was one of the managers of the Huntsville Westerns in the Southeastern League. In his biography of Watkins for the SABR Baseball Biography Project, Bill Lamb asserts that this is "demonstrably incorrect", citing Watkins' 1911 correspondence, located at the Giammati Research Center at the National Baseball Hall of Fame and Museum, on letterhead identifying him as, "W. H. Watkins, President, Indianapolis Athletic Association", the corporate name of the Indianapolis baseball club. 1 2 3 4 "Former area resident 'very worthy of honor'". Times Herald, Port Huron, Mich. October 24, 2008. ↑ "Watkins Quits Baseball Game: Former Detroit Manager Resigns Presidency". Detroit Free Press. May 31, 1922. p. 15. This article is issued from Wikipedia - version of the 3/9/2016. The text is available under the Creative Commons Attribution/Share Alike but additional terms may apply for the media files.